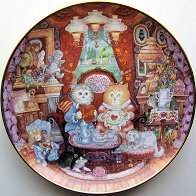 This Franklin Mint collectible cat plate features the artwork of Bill Bell. A boy and a girl cat are exchanging valentines. Other cats are looking on. The porcelain plate, made in Portugal, is 8" in diameter and it features a gold rim. Previously owned but in excellent condition.